It was a fairly quite week with low activity (volume) overall. The three positions currently open for the January expiration cycle are not threatened by now. 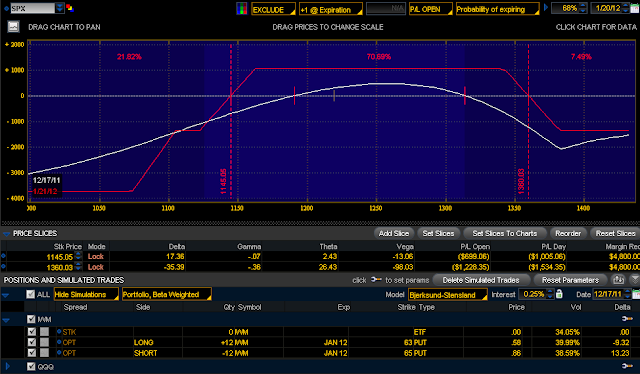 To recap, here they are: January QQQ Bear Call Spread, January QQQ Bull Put Spread, January IWM Bull Put Spread. 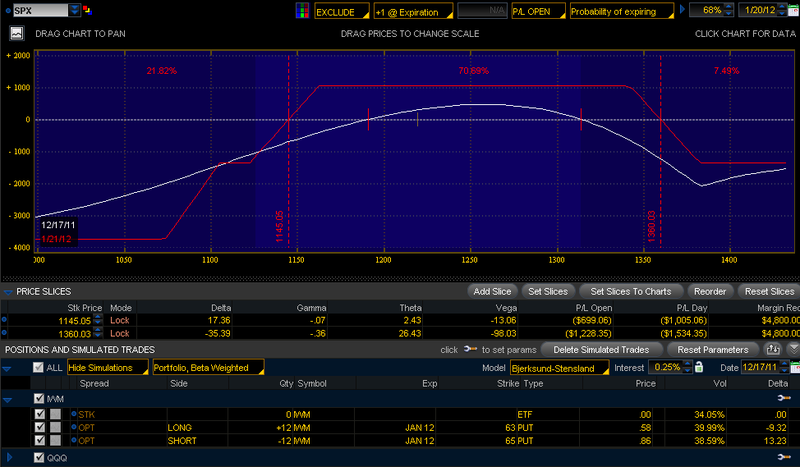 Basically two bullish positions and a bearish one (QQQ 63/61) which seems pretty solid to me. Let's take a look at the S&P500. The gray area signals a possible area of support. 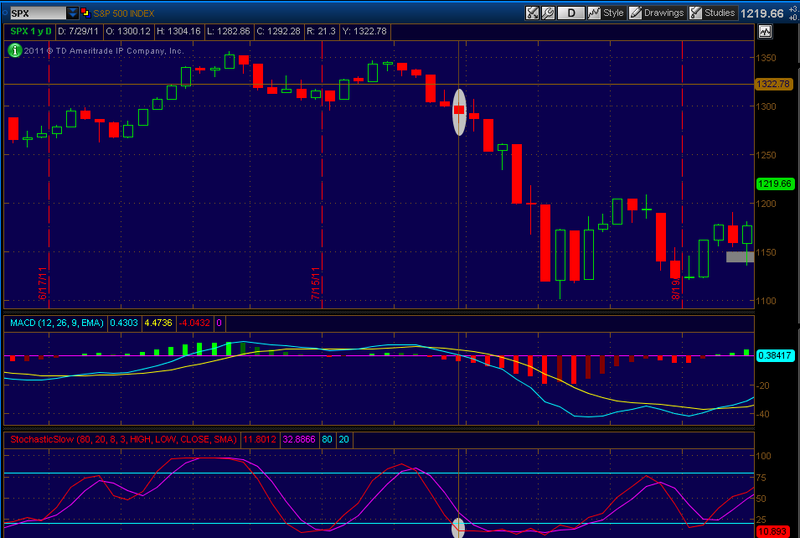 The 100SMA served as support this week. 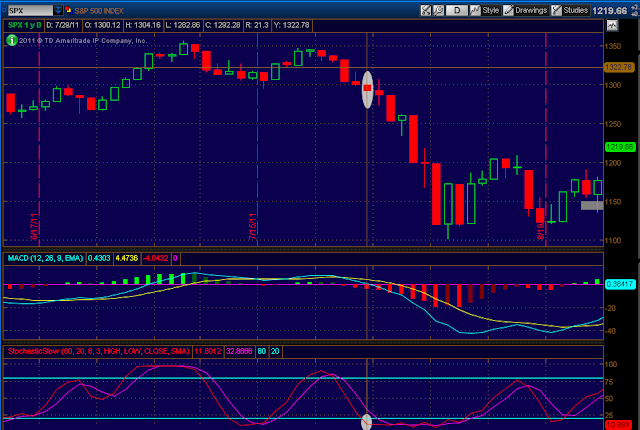 Stochastics are clearly in oversold territory, but oversold doesn't mean done. If you look back on July 29, Stochastics were in the same position as they are today and MACD was in a very similar pattern as today's. And yet the markets went down 14% after that. It is not entirely the same now. It's December, there's low activity and maybe seasonality tendencies as well, plus this week seems fairly light in news. 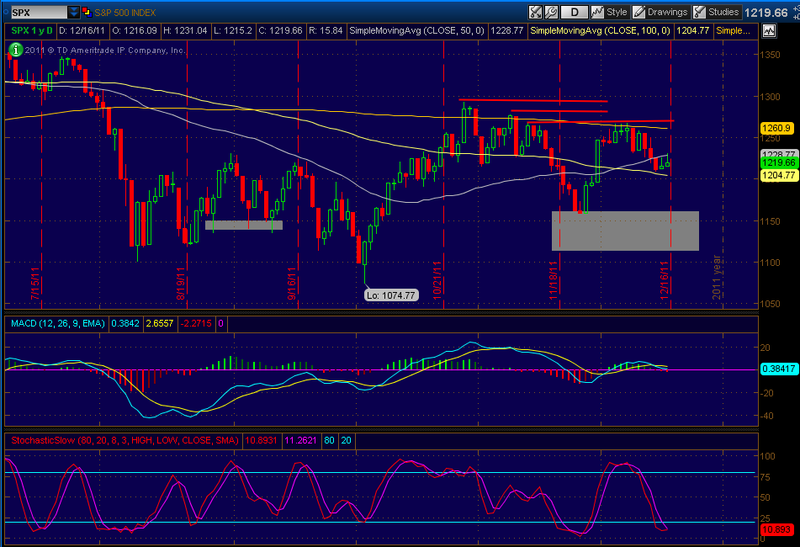 But anything can happen in the downside which would force me to adjust the bull put credit spreads. If there is huge downside this week the adjustment can be made in the same expiration month of January as there's still more than 30 days of time premium, which is always good. In spite of everything, all the pessimism portrayed by the media, the recent downtrending prices etc, the VIX has been downtrending. So, we're not in a situation of panic after all. Maybe because people are sick of this market and by now the majority has gotten out and already called it a day? (I mean a year?). 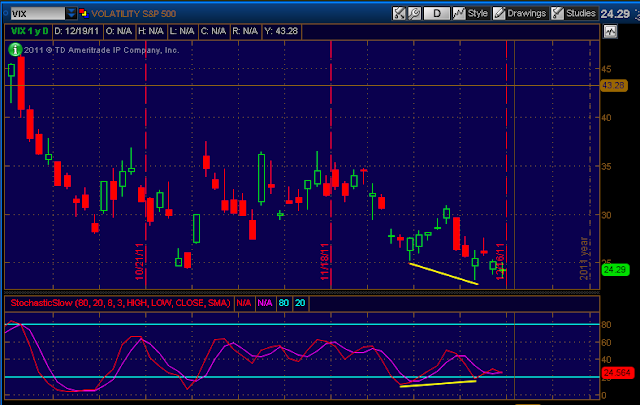 Could it be argued that there is a bullish divergence here? 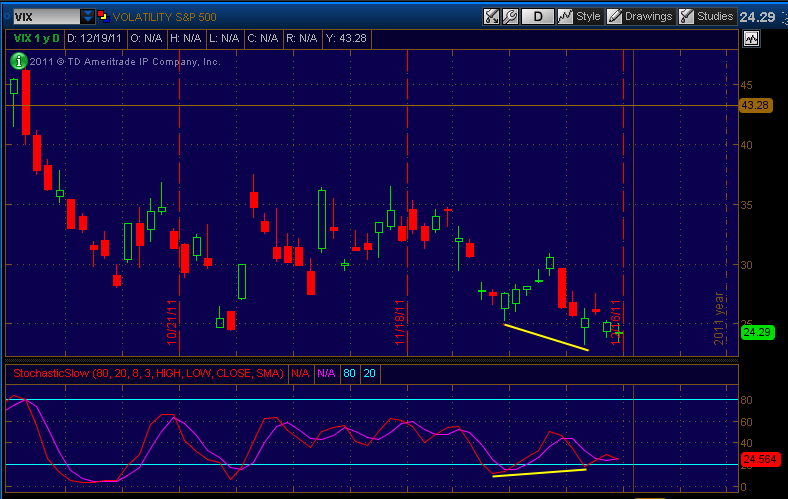 Possibly a weak one between Stochastics and VIX? 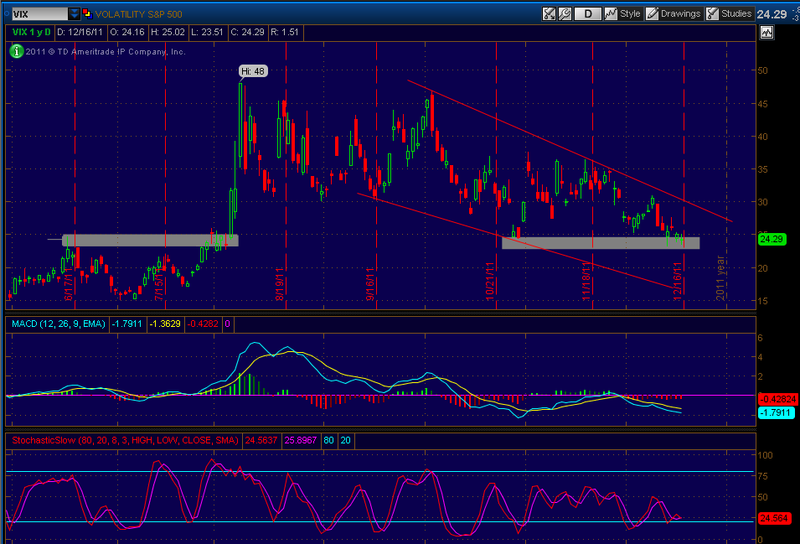 And the fact that the VIX is around support and could rebound? 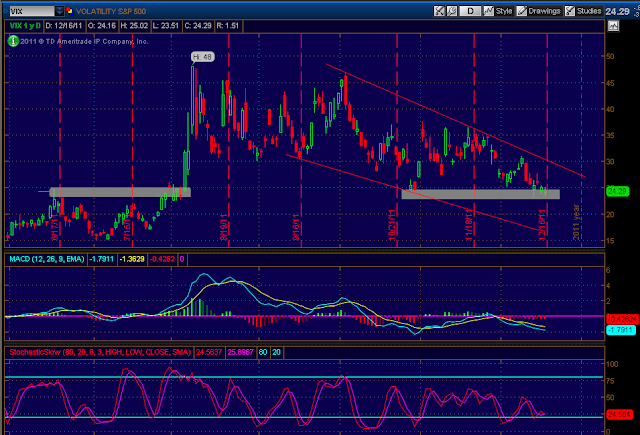 Or maybe the attempt for a rebound in the VIX already happened and failed to progress? So, this means, that the portfolio overall is "safe" if you will, even with SP500 going down to the 1145 area, which is more than 6% below current levels. Hopefully for my positions the VIX keeps breaking support or wandering in that area and we have a nice little upside move in the indexes. Hopefully, otherwise it will be time to pay attention to price action and make the necessary adjustments.